Spinner Motion Rings, CZ Hoop Earrings, Christian Jewelry and Cubic Zirconia Sterling Silver Jewelry! 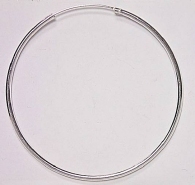 Classic 50mm x 2mm thick hoop earrings. We guarantee that our sterling silver jewelry is 925 sterling or above.